The Oriental Hotel Kobe on Kaigandori in Kobe, Hyogo Prefecture. 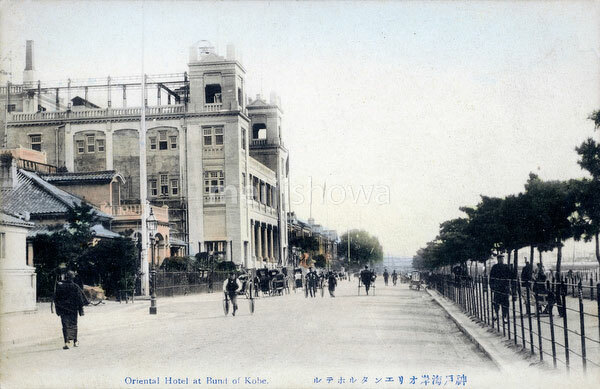 The Oriental Hotel was Kobe’s face for more than a hundred years. At the time that this photo was taken, it was known as one of the best places in Japan to stay, and even more, one of the best places to eat. It was founded by Frenchman Louis Begeux in 1887 (Meiji 20) on number 81 (Kyomachi). In 1907 (Meiji 40), the building moved to the location on this card.